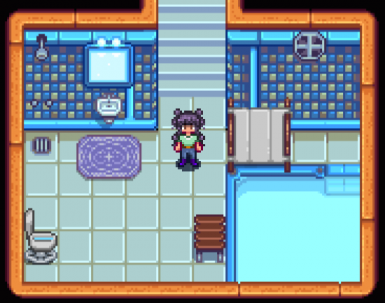 This is a mod that adds bathroom to the Farmhouse and I have made it so you can use Content Patcher. UPDATE 4.0: I have added a file that is in beta once i know that the mod works i will publish all of the other versions as well. UPDATE 3.0: removed the fireplace in the kitchen on a request. This mod is originally from DevilBro﻿. I have made some modifications so that you have more options. This mod needs Content Patcher﻿! 1. Download the .rar file and unzip it to somewhere (i recommend desktop). 3. Put unziped file inside the stradew valley -> mods. 4. You are done! Enjoy!